About two weeks ago I wondered when the Earthdawn dice from Q-Workshop will come out. Today they launched the news that the Earthdawn dice are now available, in 3 different sets. The sets include 7 dice (D4, D6, D8, D10, D12, D20, D100) and cost 14.90€ or 18.90$. Order the dice HERE or via a click on the pics. The characters gonna travel by foot, by caravan or by airship to a place or city in Barsaive. How many miles will the characters travel? How many days will it take them? And what will the journey cost, including rest in a village's inn or the cost to feed their elephant during the journey. First of all you'll have to use some maps that show you the dimensions for travelling. 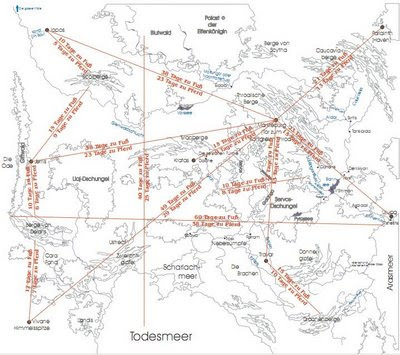 Most maps have scales for walking, riding or airsailing in miles or days. 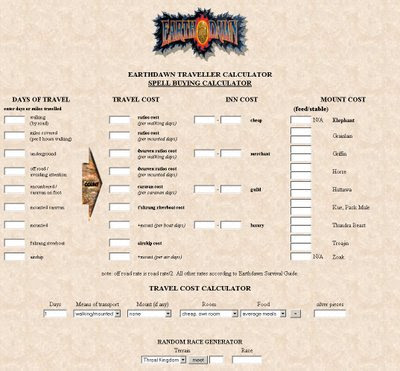 When you've found out how long it'll take the characters to walk, ride or fly, you just visit this polish PAGE to use the Earthdawn Travelling Calculator and present the characters the bill for their journey. No it shouldn't be that boring to tell the players what their journey will cost, but from now on you are informed what the airsailor will take to ship the characters including their mounts. Note: I had some problems using the calculator with firefox, just try another browser when it doesn't work properly for example Iron browser. Paratime Design offers on their page a some nice dungeon maps. So if you are looking for some kaer maps you should have a look at their roleplaying games resource page. The Silver Dragon Studios produced some nice D20 Flails. I think this "dice weapon" is a good tool for gamemasters to chastise their players x-(. Nice work, visit their site! But thru these dice I remembered that Red Brick had announced a contract with Q-workshop who would produce an "Earthdawn dice set". I discovered a link in the forum of Red Brick where Dammi points out that Q-workshop published a preview of the Earthdawn dice set. I hope the announcement of the new dice will be soon. Can't wait to buy them.